Most of us are quite familiar with the generally negative connotation surrounding the term “chemical cleaning”, both in domestic and commercial sectors. Using chemicals to clean inspires debate on the health and safety of end users, and whether or not “all-natural” solutions are better, safer alternatives. Unfortunately, the word “chemical” has become somewhat of a misnomer in recent years among consumers and even those in the cleaning industry – as it has somehow come to mean something that is hazardous, unnatural and dangerous to one’s health. However, the exact dictionary definition of a chemical is actually described as “A substance with a distinct molecular composition that is produced by or used in a process to produce a change in another substance.” While a chemical can be created by, and is more commonly referred to artificial processes, chemicals can in fact be produced naturally. For example, simple everyday chemical compounds include water (Oxidane) and salt (Sodium Chloride). In fact, all living creatures and the entire universe are comprised of chemicals. In comparison, certain naturally-occurring compounds can be inversely also be dangerous – For example, even organically grown cherries and apricots naturally contain a compound within their pits that creates poisonous cyanide when eaten! Therefore this logic of “natural equals safer” is not necessarily the case. What applies to both “natural” and “chemical” cleaning alike is the importance of understanding and awareness of both types of substances and the effects they may have on the human body or the environment. With the rise in education and modern awareness about the effects of chemicals on the environment, there has been increasing focus on “green cleaning” products, where chemicals have been specifically formulated to lessen environmental impact and harm to users. However, while those of us in the chemical industry will know where to find the relevant hazardous substance information of a product to back up such claims on a product — such as on a Safety Data Sheet (SDS) — it is much more difficult for the average customer to be able to find, understand, or even access such information. This is where reputable third-party certification systems, such as Environmental Choice New Zealand (ECNZ) can help communicate to customers that certain chemical products are recognised as having a low environmental impact and are lower-risk to end users, removing any doubts or concerns that may arise from misrepresented advertising or marketing. While there are still dangerous and harmful chemicals that exist for particular purposes, with the advent of “green cleaning” there are more choices than ever for customers in safer, environmentally-friendly and lower-risk chemical cleaning. 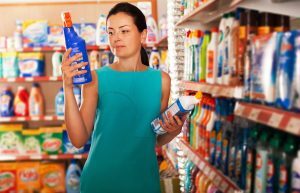 The key is information and understanding of the risks and impacts of such substances, and what is definitively clear is that with the knowledge of the wide range of cleaning products available, the word “chemical” need not be so terrifying after all.